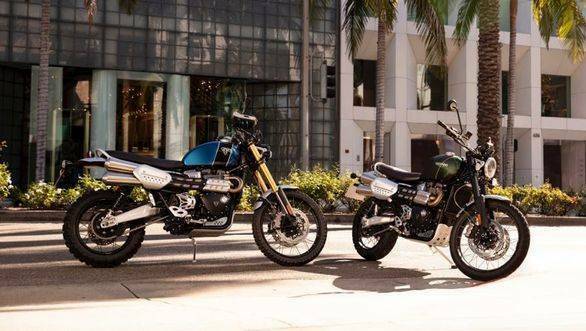 Triumph has unveiled their latest motorcycle, the Scrambler 1200 at an event held in London, UK. Triumph has made much of the Scrambler 1200's "genuine off-road capability" in the teasers and the spec is certainly promising. The motorcycle uses a 1,200cc twin cylinder motor off the Triumph Thruxton R but in a torquier state of tune. Triumph says that the Scrambler 1200 boats their most potent tune for the 1,200cc engine now. The odd bit is that they're calling it a "crossover" that blends classic or retro design elements with the format of the adventure tourer. 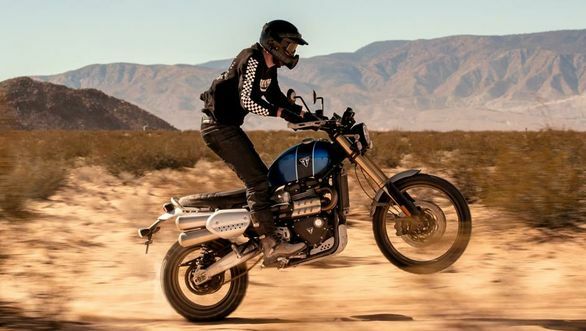 And while the Ducati Scrambler Desert Sled is the fairly obvious target, the Triumph Scrambler is built on Bonneville base elements and not on the Triumph Tiger. There will be two models. The base Triumph Scrambler 1200 XC and the fully-loaded, more off-road friendly XE. 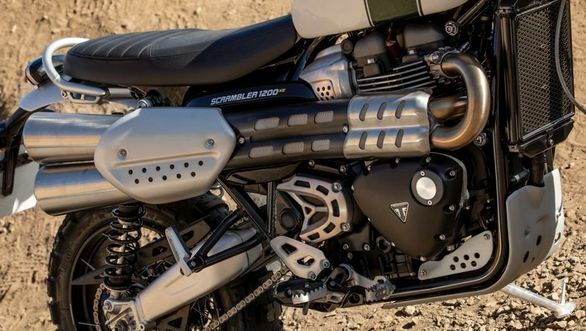 As we noted, the 270° firing parallel twin is the same as the Thruxton R. But the power and torque curves are both more robust on this ride-by-wire engine. 90PS arrives by 7,400rpm and peak torque is 110Nm at 3,900rpm. Triumph is also boasting about the 16,000km service intervals. The frame is a tubular cradle but the XE and the XC models of the Triumph Scrambler 1200 have slightly different steering geometry. The XC uses 25.8°/121mm rake trail while the XE uses 26.9°/129.2mm. The two also don't share the same suspension. The XC gets 200mm travel at either end (Showa forks, Ohlins twin shocks) while the XE uses Ohlins suspension with 250mm travel. The rear units are fully adjustable as are the front forks. Braking duties go to twin 320mm Brembo M50s up front and a 255mm read disc. At 205 and 207kg, the XC and XE models aren't very heavy for their class either. That's a pretty solid set-up, right? 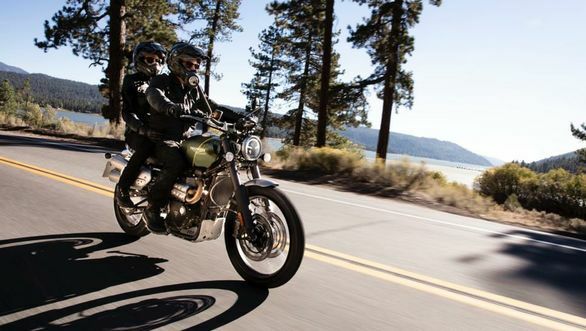 The Triumph Scrambler 1200 also represents the debut of (finally) state-of-the-art electronics. Continental supplies the inertial measurement unit (IMU) that makes the magic happen. So you get five riding modes including a custom one and an Off-road Pro mode on the SE that uses a special throttle map but turns off ABS and traction control. The bike also has cornering ABS as well lean-sensitive traction control. A wonderful, customisable colour display with the Triumph joystick (now backlit) controls the system. But there's more! Triumph says they now have Bluetooth access to GoPros as well as Google Maps built in. That means you can use the Triumph switchgear to control a GoPro. The instrument panel can also display basic icon-based navigation information right on the dash off your phone's app. 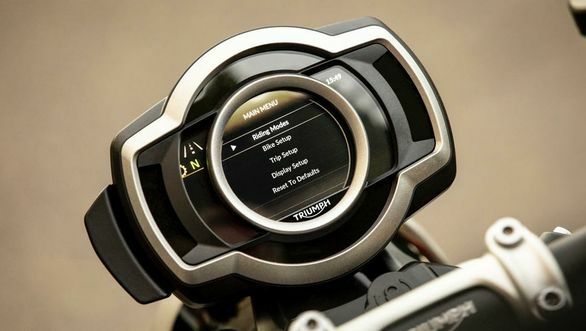 The new Triumph app will help work these features and control music and calls easily according to the company. Triumph has not confirmed the launch plan for India but we expect the Scrambler 1200 to arrive early next year. Prices will be high, rivalling to exceeding the upper Tiger 800 models at the very least. For the money, you will get comprehensively equipped motorcycles to be sure. What remains to be seen is how the buying public reacts to the decidedly oddball styling that blends stylish details, a retro tank with the typical stance and heft of an adventure tourer. And while quality looks good, there is the matter of the seat height - which is lofty (840mm XC and 870mm XE). I got a very short spin on the dirt and my impressions are of a smooth motor, strong brakes and suspension that works well. The rest we will wait to find out once the bike comes to India.